Casters and wheels are offered in many sizes and types. 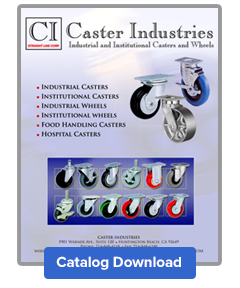 Although there is no simple formula to follow in choosing the proper caster or wheel, the WHEEL APPLICATION GUIDE on page 5 and the information provided with each caster series will help you select the right casters and wheels for your application. properly maintain your casters The information below and on the following page is intended as a guide to assist you in specifying, operating, and maintaining casters for safety and maximum life. Selecting the correct caster for your application is very important. If you do not select the correct caster, you or the users of your equipment could be injured. If you are not absolutely sure which caster is the correct one for your use, contact a safety or engineering consultant who knows your equipment and its intended use to assist you. The first consideration of caster selection is to determine the combined weight of equipment and maximum load. Generally, the greater the combined weight, the larger the wheel must be. Larger wheels distribute weight and roll more easily. To determine the load capacity for each wheel, divide the combined weight of equipment and maximum load by the number of casters to be used. This is the weight that each caster and wheel must support. Even though Jarvis' load ratings include a safety factor, always select a caster and wheel that are rated for a capacity greater than the calculated load per caster. It is important to select casters with extra load capacity to allow for unusual circumstances. There are various types of wheel bearings available. Have your consultant or engineer determine which bearing type is appropriate for your specific application. The following is some basic information about each type of wheel bearing. Self-lube Sintered Iron is an economical oil-impregnated bearing suited for light loads, or heavier loads that are stationary most of the time. liquids, solvents, or sprays are used, select medium- or heavy-duty industrial grease-sealed casters. Ball Bearings are used where maximum rollability is required. This type should be used for loads from 400 to 1,200 pounds. Because of the ball contact area, ball bearings are the least frictional type available in caster wheels. Roller Bearings are used when greater load capabilities and rollability are required. Hardened rollers revolving around a hardened spanner bushing distribute the heavier load over a larger area. Delrin Bearings are an impregnated Dupont plastic product that performs efficiently in a wide temperature range. They are durable, corrosion resistant, and require minimum lubrication even in steam cleaning or where water or other liquids are present. Work conditions must be carefully evaluated before selecting wheel material (see WHEEL APPLICATION GUIDE on page 5). The presence of acids, oils, or corrosive chemicals requires wheels made of polyurethane, phenolic, polyolefin, or steel. Never use rubber in any corrosive environment. Extreme temperatures require special bearing lubricants, available from Jarvis. For the heaviest loads in material handling and industrial applications, select drop forged casters with double ball bearing nut and bolt kingpin construction. For factory, warehouse, and large retail operations, select heavy duty cold forged casters. For handpushed material handling equipment, select standard heavy duty casters. Always make certain to choose casters within the manufacturer's load capacity specifications. For most institutional applications, select medium or light-medium duty casters. As a general rule, hard treads perform better on soft or smooth floors, and soft treads roll better on hard or rough floors, including most outdoor surfaces. When choosing a wheel, take into consideration all special floor features -- tracks, gutters, grates, sills, or dock plates. The larger and softer the wheel, the greater the ability to roll over rails and similar obstacles. To protect floors from damage, choose softer materials. Rubber, especially high modulus rubber, will give quietest movement and maximum floor protection, while steel is hardest on floors. Polyurethane is frequently an effective compromise, giving moderate floor protection with greater load capacity. In hospitals or other facilities where cart washings are required, select nickelplated casters with grease seals and zerk fittings. For very frequent washings or wet environments, select stainless steel casters. In manufacturing facilities or other areas where dirt, grease, liquids, solvents, or sprays are used, select medium- or heavy-duty industrial grease-sealed casters. For small, low equipment, such as office machines, select very wide, small diameter wheels from our business machine section. For medical equipment, such as case carts or instrument carts that require swivel locks or positive brake swivel locks, select our 50/50H health care series casters.